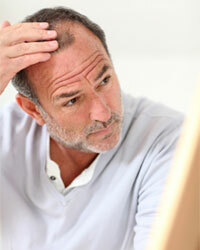 Few things reveal your age—and can even make you feel older than your years—like dull, brittle, thinning or graying hair. And as distressing as it can be to see your hair lose its youthful luster, even more important is the fact that the appearance of your hair is a reflection of your overall health and vitality. So addressing concerns about the appearance of your hair, and getting to the root cause of these issues, is not merely a matter of vanity. Given this, it's not surprising that millions of people search far and wide for solutions, sometimes turning to risky, side effect-laden hair growth medications, topical hormone treatments, costly hair transplants or restoration surgery. And many people simply give up and accept the "fact" that the appearance of their hair will just continue to go downhill. Before you spend your money on products that may leave you disappointed, or resort to undergoing an expensive procedure, I want to share a secret I've used to keep my hair looking healthy as I've gotten older. It's completely natural and side effect free, and unlike conventional hair loss solutions, it addresses the root cause of dull, brittle, thinning and graying hair. And in the process, it helps to revitalize your entire body from the inside out! My name is Joshua Corn and I'm the Editor-in-Chief of the Live in the Now newsletter, one of the fastest-growing natural health publications in the nation. My passion for natural health drives me to seek the truth and to educate people on alternative solutions that are safe and effective. Imagine if there was a simple solution that that could help restore your hair's natural color and luster while dramatically reducing—and even reversing—hair loss, leaving you with thicker, fuller, shinier hair. You don't have to imagine, because it's true, and I'm about to reveal all the amazing details. Please keep reading if you have been concerned not only about the appearance of your hair, but about what your hair may reveal about your overall health. This may be the best news you have read in a long, long time. There are several key nutrients that provide the building blocks needed for healthy hair growth, and I'll explain the details to you in a moment. But first, I want to tell you about an amazing herb I initially learned about from my acupuncturist, who happens to also be a master herbalist and a highly skilled practitioner of Traditional Chinese Medicine (TCM). I was merely joking when I mentioned to her that I'd like something to prevent hair loss and keep my hair from going gray. So you can imagine my surprise when she immediately handed me a small amber bottle filled with a powdered herb. As it turns out, TCM has an herb which has been used for centuries for precisely that, and it's recently been the subject of gold-standard clinical studies! He shou wu (Polygonum multiflorum), or fo-ti as it is sometimes called, is used in Traditional Chinese Medicine as a vitalizing tonic and blood cleanser that helps to unblock and rebalance the body's essential life force energy or qi to promote vitality and longevity. With its earliest documented use dating back to 713 AD, he shou wu is often given to people who are exhibiting premature signs of aging, such as thinning or graying hair and wrinkles.﻿ It's also used as an aphrodisiac and virility tonic. He shou wu literally means "Mr. He with dark hair." As the colorful tale goes, Mr. He was a middle-aged man who became depressed because he was unable to have children, and with no family to raise, turned to drinking heavily. His strength faded, his vision and hearing went dull, and his hair turned gray at an early age. Then one day while stumbling through the forest, Mr. He saw two vines intertwined that reminded him of a loving couple. Intrigued by this sign, he dug up the roots and showed them to a local monk who advised him to eat the root daily, claiming it will restore his fertility. 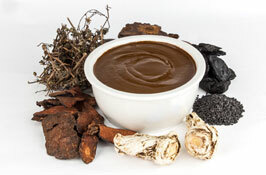 Within weeks of taking the herb, his health problems vanished, and his vitality surged. He married a local widow and, within a year, his hair turned from white to black. He went on to father 19 children and lived to be 160 years old! Now this legend may be a bit of a stretch, but the truth is that he shou wu has long been revered throughout Asia as a powerful tonic for rejuvenation with the unique ability to restore hair to its original color and thickness. And now, this time-tested herbal remedy has finally made its way to the U.S. where it is just starting to become popular as clinical research is demonstrating its amazing power to restore thick, shiny hair, as well as overall vitality. Once I learned about the mythical sounding claims surrounding he shou wu, I was eager to see if this ancient "legend" was supported by modern scientific research. And to my amazement, I found that it is—better than any other herb studied to date when it comes to reducing hair thinning and graying, while promoting its strength and luster! When I began taking he shou wu and experiencing its remarkable health benefits, I was excited to recommend it to my readers, friends and family. However, it was so obscure at that point that there weren't many products out there formulated with it that I trusted. It's extremely important to verify the botanical identity, purity and safety of all herbs. And the only he shou wu I could find that met my stringent quality standards was unfortunately absurdly expensive. I knew there had to be a better, more affordable solution. You see, in addition to my work with Live in the Now, I also run Stop Aging Now, a company that has been making premium-grade natural health products for over 20 years. I immediately went to work with my Scientific Advisory Board to bring an advanced, yet affordable, hair care solution to market that provides the best-of-the-best he shou wu, along with the three other key nutrients that are needed to get best results. This cutting-edge new formula is called HairGevity™. And given the purity, quality and potency of its ingredients, it's extremely affordable (as low as $14.95 per bottle), 100% natural and is guaranteed to provide dramatic results for healthy, youthful-looking hair, as well as overall vitality. • Boasts a Powerful 650 mg Dose of Standardized He Shou Wu: A revered remedy for combating premature aging with documented effectiveness for reducing hair loss and graying, this clinically researched extract and dosage of Polygonum multiflorum has been shown in multiple gold-standard studies to help restore hair to its more youthful thickness, luster and natural color. • Contains Only Authentic, Pure, Natural Ingredients: There are many products out there labeled as "he shou wu" that are made from a completely different plant altogether. What you want is a Polygonum multiflorum extract made from the root of the plant and standardized to 3.5% propanoids, the most active constituent, which is exactly what you'll find in HairGevity. We worked exclusively with a trusted ingredient supplier, and then double checked with extensive raw material testing at our Florida manufacturing facility to make sure that what you're getting is precisely what is listed on the label, and that it is 100% pure, with not a trace of the heavy metals or other impurities common in low-quality supplements. • Quality You Can Trust: HairGevity is made in Stop Aging Now's own FDA-inspected facility located in Florida to meet or exceed the stringent USP standards for quality, purity, potency and disintegration. • Convenience That Can't Be Beat: Just two small veggie capsules per day give you everything you need for significant, long-lasting improvements to the appearance of your hair. It takes just a few seconds, and you'll love the results. 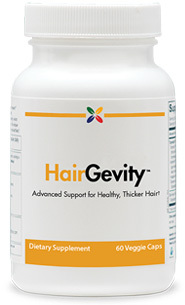 • Affordable, Ships for Free and Is Risk Free: HairGevity is priced as low as $14.95 per bottle containing a one month's supply, which is half the price of similar formulas. It also ships to you for free and comes with an amazing guarantee! If you're not satisfied for any reason, you can return it any time within one year of purchase for a full refund. It's as simple as that. As with all of our products, I personally guarantee the quality of HairGevity. I use it every day. So does my wife and many of my colleagues and friends. I also personally inspect the manufacturing facility where HairGevity is made on a regular basis to make sure my rigorous quality standards are being met, so I feel very comfortable saying I stand by this product 100%. If you don't like it, I will gladly give you a 100% refund up to one full year after purchase. That way, you risk nothing to give it a try. The great news about HairGevity is that you'll start noticing the effects faster than you probably ever dreamed possible. And over time, you can expect the results to get better and better as your hair continues to grow and youthful luster is restored. Plus, the fact that the ingredients found in HairGevity are all natural means that you're not simply getting short-term benefits at the risk of long-term damage, which is the case with so many widely advertised hair care products. Whether you're concerned about preserving your hair's current appearance, reducing graying or thinning, looking more youthful or simply supporting your overall health and longevity, HairGevity is a smart investment. I hope you will take advantage of this chance to try it without risk! 1. Blum JM. Prospective, randomized, double-blinded, placebo-controlled clinical trial to test the efficacy and short-term safety in women of NuHair, Marshall-Blim, Biotech Corporation, Glastonbury, Conn, USA 2002 as reported in BioMed Res Int. 2015;2015: Article ID 651048. 3. Colio G and A Bosio. Alopecia and its treatment-the reality of the new chances of success, in the clinical study of NuHair: first food supplement with great scientific impact. in How & Why in Medicine, Dermatology 2002 as reported in BioMed Res Int. 2015;2015: Article ID 651048. 4. BioMed Res Int. 2015;2015: Article ID 651048. 5. J Ind Eng Chem 2013;19:13331-9. 7. BMC Complement Altern Med. 2014;14: 250. 10. Int J Trichology. 2009;1(1):6-14. 11. Am J Clin Nutr. 1978;31(10 Suppl):S94-8. 12. Skin Appendage Disord. 2017;3:166-9.